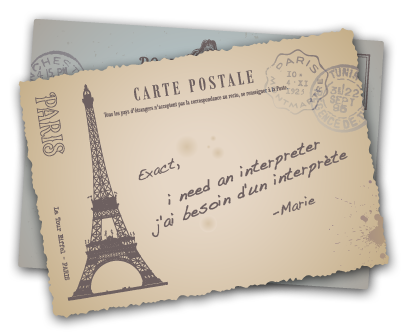 For all your professional interpreting services needs, look to Exact Translations! At Exact Translations, we are the one-stop, hassle free solution to all your French translation needs. We provide top-notch French interpreters, for both consecutive and simultaneous professional interpretation work, throughout Vancouver, and anywhere else via teleconferencing. A French interpreter is available for assignments such as press conferences, business meetings, sports camps, seminars, and media interviews. The needs of our customers vary, as do their industries. informational meeting between parents and administrators of French academics. In today���s global economy, life can lead you to exciting opportunities around the globe, or in your own backyard. Trust Exact Translations to bridge the language barriers and help you succeed! If you're ready to have Exact Translations provide you with professional interpreting services, contact us today, or submit your request for a quote below!